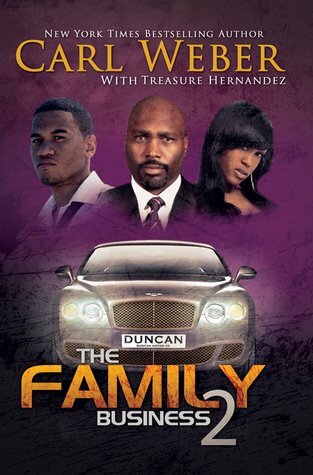 Yes y’all, Carl Weber is back with one of my much-anticipated follow-ups, The Family Business 2. This time, he’s paired up with Treasure Hernandez, author of the popular Flint series. I absolutely loved The Family Business 1 and hoped that this one would be even better. So what do I think about this one? Keep reading and find out! The really quick rundown: The Duncan clan is back at it, running their car dealership operation and their drug business. Orlando is still in charge and has come up with a plan to take over the drug world and make the Duncans their own bosses and a force to be reckoned with. However, will Orlando’s new idea unite or break up the family? Orlando and LC face an unlikely opponent in Chippy, who is hell-bent on keeping her family together. No amount of money or power is worth losing her family. The Duncans also bring in other family members for their mission, who will take on a bigger role than imagined. So I lied. This isn’t exactly a really quick rundown. Anyway, in addition to inner family issues, Orlando is dealing with baby mama drama. Ruby has moved on, but is the man she’s with truly who she thinks he is? London and Paris, despite their sibling rivalry, are in the same boat of not knowing who the fathers of their babies are. Lastly, Junior, the big teddy bear, finds a love of his own. My thoughts: I admit it. I enjoyed this book but not as much as the last. However, do I still recommend it? Hell yes! Carl and Treasure did their thing here. I laughed, I shook my head, I applauded. It had a mix of deceit, revenge, lust, well, lots of lust, and was just straight up entertaining. The story was well written, fast-paced, and easy to read. Despite their ways and dealings, I can honestly say I enjoy this family. There is no doubt that they love each other and is a family first. I especially loved the two fixers getting together and handling business in the end. That really was amazing, but I did laugh that it didn’t go exactly as planned. Harris really got himself a set of balls this time around. However, considering what he had to do in the last book, I see why. Mama Chippy… I underestimated her. I thought she was a trophy wife, but mama had me shaking my head at her. Smart, she is, and devious when she wants to be. Paris is still Paris, but with a baby in tow. In brief, read this follow-up. I enjoyed it and couldn’t put it down. Of course there is to be a part 3 to be released in the fall of 2014, The Family Business 3: The Return of Vegas. In the meantime, watch out for To Paris with Love. Weber teams back up with Eric Pete (for both of these to-be released novels), which is sure to be another good read.